Political correctness needs an end-date. That’s literally no joke. This topic was covered a little bit last week with a portion of an interview with comedian Bill Burr. His take was terrific and funny. However, SNL-alum Colin Quinn’s micro-analysis joke on this subject may have revealed the true insanity (no hyperbole) of society’s PC losers. Colin Quinn: An impressive collection of bland molecular cells without any distinguishable features or opinions that could culminate in the micro or macro disruption of the sensitive nature of a fellow life form. Colin Quinn: It’s scary how accurate that material is today, but thank you for creatively pointing out how ridiculous this absurdity has become and that it needs to stop. Have an Awesome PC-Free Week! As we enter the weekend, able to take some deep, reflective breaths before having some unbridled fun, this seems like the perfect time to be inspired. We don’t always see where motivational moments will come from and usually the surprise has a profound effect as a result. Here’s Will Smith’s explanation of his distinctive vocabulary. This childhood anecdote is one of the main reasons why Will Smith is everyone’s fresh prince. Somehow, someway, society “officially” decided that we should dedicate an entire day to remembering past greatness. “Throwback Thursday” gives us pause to reflect on life’s highlights. Speaking of which, on this day back in 1953, the classic Roman Holiday premiered in theaters. The beautifully romantic tour de love and laughter introduced the world, in center stage fashion, to the stunningly beautiful, adorably quirky and amazingly graceful Audrey Hepburn. I really need to travel to Rome and make my own holiday. 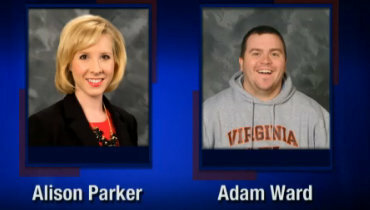 In the early hours this morning, WDBJ reporter Alison Parker and photographer Adam Ward were shot and killed during their live broadcast in Moneta, Virginia. Absolutely horrific. As a former broadcast journalist, this devastating news sent chills down my spine. They were just out doing their jobs. There are no words. Despite the fact the suspect’s name has been released and there is video of the murder, that footage will not be shown on this blog out of respect for the victims. And the name of the murderer will not be disclosed here because he is nothing but a hellish monster. Prayers are with their loved ones.